Astrophotographer Giuseppe Petricca captured this dazzling photo of the quarter moon and fireworks over Pisa, Italy on June 16, 2013. Petricca snapped the photos during a fireworks display launched from the Arno River during Pisa's Patron Saint's Day celebrations. Fourth of July fireworks celebrations will light up the sky across the United States tonight, but one veteran astrophographer in Italy has already captured a dazzling view of an explosive night lights display that also co-stars the moon. 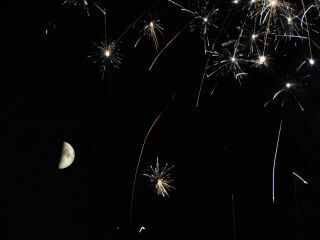 Night sky photographer Giuseppe Petricca of Pisa, Tuscany in Italy captured the dazzling view of a fireworks display and the quarter moon on June 16 during Patron's Saint Day celebrations in the city. "Yesterday in Pisa was the Patron Saint's Day, and I managed to catch fireworks, launched from the middle of the river Arno, exploding near the first quarter moon!" Petricca told SPACE.com in an email. "Really a nice composition!" Petricca said he used a Nikon P90 Bridge digital camera on a tripod to snap the photo, and then used image processing software to clear away noise in the image and enhance details of the moon's surface. The patron saint of Pisa is Saint Ranieri. The city honored Ranieri with annual fireworks or bonfire displays since the 15th century, according to the tourism website Pisa Online. The Luminara, a tradition that decorates parts of Pisa with candlelight to honor Ranieri, dates back to the 19th century. Editor's note: If you have an amazing night sky photo you'd like to share for a possible story or image gallery, please send images and comments on the image, including equipment used, to managing editor Tariq Malik at spacephotos@space.com.